Monday the Bethlehem Bible College, an Evangelical Christian college in Jesus’s hometown, opened its fourth biennial Christ at the Checkpoint conference. The conference, which is directed specifically toward US Evangelicals, will run through the week. Today, Evangelical communities in the US number anywhere between 60 and 150 million people, depending on who is counting. They form the backbone of American support for the Jewish state. It is the support of the Evangelical community, rather than the Jewish community in the US that ensures that come hell or high water, no matter how Israel is demonized in the media and in academia, the majority of Americans continue to support Israel. But will this support last? One of the more surprising aspects of the 2016 elections is Evangelical support for businessman Donald Trump. Trump in many ways personifies everything that people who take the Bible seriously are supposed to oppose. He owns casinos. He curses and uses profanity in his public appearances. He has donated to Planned Parenthood and forcefully supported abortions on demand. Trump has also insisted repeatedly that he will be neutral toward Israel. Perhaps the most extraordinary aspect of Evangelical support for Trump is that he takes these positions as he runs against primary opponents who all wear their faith on their sleeves. All of his opponents have records of standing with the Evangelicals on social and other salient issues – including support for Israel. What are we to make of this seemingly inexplicable phenomenon? At least as far as Israel is concerned, the readiness of Evangelicals to support the most anti-Israel candidate running for the Republican presidential nomination is no surprise. To understand why this is the case, the Christ at the Checkpoint conference taking place this week in Bethlehem is a good place to look. The problem begins with the organizers’ interpretation of those teachings. College officials, among them keynote speakers at the conference, embrace and teach replacement theology. That theology maintains that God’s covenant with the Jews ended with Christianity. In recent years, replacement theology has extended its biblical revisionism from Jews as people reviled for their rejection of Jesus and their supersession by Christians to Israel. The Jewish state is reviled as a religiously prohibited entity whose very existence is a sin against God. According to current replacement theology, Jesus was not a Jew. He was a Palestinian. The Jews are not a people. They have no rights to the land of Israel. Israel, it is asserted, has no historical or theological right to exist. Rather, according to the rewritten scriptures, the Palestinians are the chosen people. Jews are colonialist invaders who have taken the land of Israel away from their rightful, biblically sanctioned owners. Today a Jewish Jesus would be prohibited from entering Bethlehem. Jews are barred from entering Palestinian population centers because Palestinians have a habit of murdering them. Indeed, just last week two IDF soldiers who accidentally entered a Palestinian village north of Jerusalem escaped a lynch mob by the skin of their teeth. On the other hand, a Palestinian Jesus can be in Bethlehem. But to leave he has to go through an Israeli checkpoint (to ensure that he isn’t a terrorist, to be sure, but whatever). So the image evoked by the name “Christ at the Checkpoint” ignores the reality of Palestinian terrorism. And it leaves us with an image of the repression of a Palestinian Jesus at the hands of the Jews. The replacement theology at the heart of the conference was made explicit by Rev. Jack Sara, president of the Bethlehem Bible Conference, at the 2012 conference. In his speech Sara edited Chapter 37 of the book of Ezekiel to transform the dry bones prophecy. That prophecy, of course, is one of the most Zionist passages in the Bible. God speaks to Ezekiel and tells him that the people of Israel will be reborn. They will be gathered from the four corners of the earth, return to Israel and restore the Davidic kingdom. Yet in Sara’s revised version, the people of Israel, the descendants of Jacob, are replaced by the Palestinians. Sara preached, “The hand of the Lord was on me and He brought me out by the Spirit of the Lord and sent me in the middle of the West Bank – Bethlehem, Jenin and Salvit and Nablus and Ramallah. Last March the Bethlehem Bible College posted a promotional video ahead of a summer Christ at the Checkpoint conference directed toward young adults. As Tricia Miller, who works as a senior research analyst for CAMERA noted, Christ at the Checkpoint director Munther Issac billed the conference as a means to empower Palestinian Christians. The video interlaced footage of Palestinians walking in heavy traffic and waiting to cross into sovereign Israel with footage from Islamic State (ISIS) videos showing hostages about to be beheaded and burned alive. Israeli flags flapping in the wind were juxtaposed with the ISIS flag. And then, apropos of nothing, the video showed the cellular structure of the H1N1 swine flu virus. The implied message was clear. Just as Nazi propaganda depicted Jews as viruses, so the Christ at the Checkpoint video depicted Israel as the moral equivalent of ISIS and the medical equivalent of swine flu. 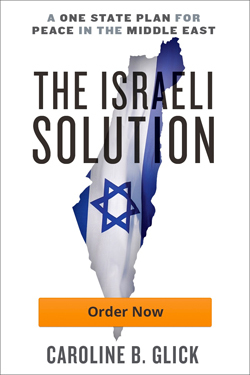 In 2014, David Brog published in article in Middle East Quarterly detailing the key role the Bethlehem Bible College plays in a wider campaign directed toward American Evangelicals whose goal is to undermine and eventually end their support for Israel. Key figures in this undertaking bring American church leaders and academics to Bethlehem and feed them a diet of anti-Israel propaganda and outright lies masquerading as biblical teaching and objective assessments of reality. These American Christian leaders have taken up the cause of ending support for Israel among Evangelicals upon their return home. Key financiers, like Mart Green, the heir of the Hobby Lobby fortune and the chairman of the board of trustees of Oral Roberts University, and financier George Soros have been instrumental in disseminating these positions to all levels of the Evangelical community in the US. Cruz’s statement marked the first time a major US political leader stood up to the Jew hatred of Middle Eastern Christians and pointed out its irrationality and self-defeating core. It could have been a seminal moment in the discourse on Islamic persecution of Christians. But rather than be embraced for his willingness to speak the truth to those who reject it even in the face of genocide, Cruz was assaulted as undiplomatic by Washington Post writer Jennifer Rubin. His message was largely ignored outside of policy circles. To be sure, the largest Evangelical communities remain solidly supportive of Israel, and their size dwarfs that of the rising forces of replacement theology and its concomitant hatred of Israel. Yet, as Brog noted, the long-term trends are discouraging. Moreover, the readiness of Evangelical voters to support the only Republican candidate who says he will be neutral in his handling of the Palestinian conflict with Israel indicates that anti-Israel Christians may already be having a profound impact on their communities. This trend represents a strategic threat to US-Israel relations. Those who wish to maintain those relations in the long term must fight this trend head on, beginning with this week’s Christ at the Checkpoint conference.